* For dearest Orhan Cem Çetin who mentioned "Anders pulling splinter from his foot" photo by Wolfgang Tillmans and inspired this article. * Thanks to Moyra Davey for his guide in terms of form. For me, a splinter represents something that is personal; something that will lose its impact if it is shown to others; something that is attributed with an extra value because of the fear of losing its impact; something that sometimes overwhelmed by this extra value but nevertheless still be emphasized. It is not easy to split and dissect a word which's origin is based on splitting. When I try to take a few steps back and look through the eyes of others, I realize that what I have talked about up to this point is not easy to picture, because everything I've said is about the image of splinter rather than its physicality. It is not an easy task to address such a small and purely physical concept. But I'll do my best to keep in mind that these metaphors are posteriority. The splinter occasionally appears in various visual arts; sometimes in a photograph, in whole body of a project, in a book, in my own skin, in the connotations of yellow… It flashes for a moment, then goes back to the shadows. Maybe I am the one who ascribes these meanings. In this article, I am imagining being able to explain the splinter through the visual arts and literature without losing it. It will be an article that only focuses on the splinter and itself. For a starting point, I have chosen a work where the splinter is physically present. The first work comes in my mind -of course- "Anders pulling splinter from his foot" (2004) photograph by Wolfgang Tillmans. Truly, his narrative of the splinter is so pure and comes out from his inner self. Although this photo is my favorite one from the brilliant artist; I have chosen to show these two images together in respect to his genius that brings them side by side on a book page. These two pages - side by side - are close as becoming and harmonic as the words elaboration and obsession. After this first physical encounter, as always, the figurative meanings of the splinter descend upon the photograph. The words "small", "splitting" and "stinging" call the word "disturbing" by their side. In this case, as small as a splinter, tiny and basic message given by Tillmans is: if you are a runner and have a splinter under your feet, then it becomes the biggest problem of the world. 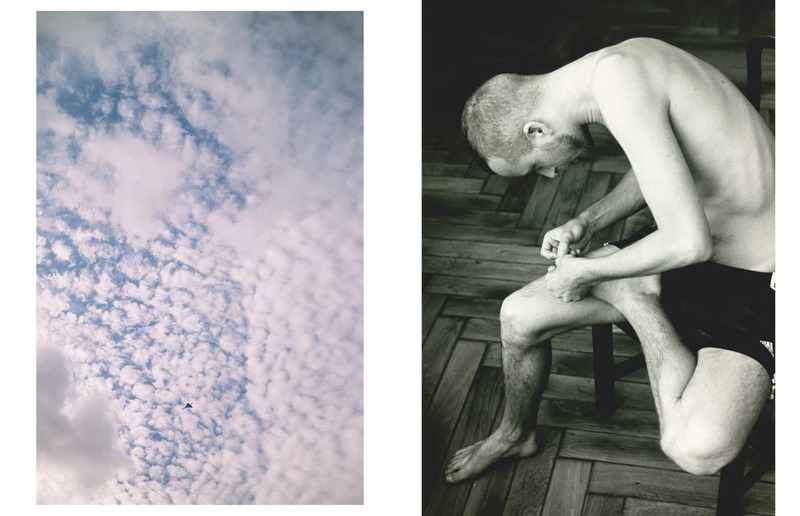 When Orhan Cem Çetin looked at my photographs in 2015, he put this photograph and anecdote of Tillmans in my memory and established the relationship between me and my photographs -which are generally based on personal stories- by comparing to the one between the runner and the splinter, a relationship which intertwines both sides and makes them become the same. So, the fact that the splinter is very important to me is based on the metaphors it has in it. As a fresh photographer who describes herself as not on the road, but searching for a road; "splinter" is a very important source of inspiration in my effort to visualize what is personal, what is truly and merely mine. It seems very easy to "create from inner self" when mentioned, but it is something very easy to overlook in the face of the search for a communality in feelings and the humanness of the gratification of pain for the sake of feeling powerful. Not to mention the relief of being understood -as profound as possible- by someone else and thinking "I am not alone." Last December, with a burden of a recent break up, I began to make a list of things in a bedroom that I assume I will not see again. Pillow patterns. The shapes you see on the ceiling when you lie on the right side of the bed. Tassels at the end of the curtain. Rosary. Putting a lamp to prevent the window from closing. The closed side of the coffee table. The open side of the coffee table. Beer bottles placed there. Three centimeters narrowness of the stereo from the table below. The items placed there. Concentrated juice bottle. Qopuz. 70 cm distance between the creaking floor and the bed. Constantly wrinkled rug. The feeling that the couch will topple over. The nose of one of the figures on the ashtray. Barcode under the black ashtray. Fucked-up violin bow above the wardrobe. Yusuf Atılgan and Tomris Uyar. Book cover swelled with water. Black fabric squeezed under the door. The lid of the nut container used as garbage. The small part of the bed that appears under the bed linen. Brushes of the drumstick. The temperature of the ground in the summers. The tip of the nail welcomes you by stinging when you walk through the door. Owl. Round puzzle. The drawer with only one knob. Scent. I don't know what was the instinct behind the list and why I didn't prefer to adopt a cold listing method instead of expressing my feelings. But the fear of the moment after some time, gradually these details will be slipped from my mind made me stay up one night, and sit, wander, take quick notes, drink coffee, go to the table, left the other tab, and return to making this list. It is as if I had a chance to carve all those memories; I could have reached to and intervened with the core of them instead of reaching to a point. In other words, it was as if I go down to the bottom of my memories, I would also reach the essence of my sadness. A collection of crumbs. Although everything I've told so far is a stream of consciousness which blinks from time to time; I correlated them with each other after reading Asterios Polyp., the graphic novel by David Mazzucchelli that reminds me of the weakness on the shoulders. Because of his bravery and fellowship in obsession, I personally love him aside from the admiration of his expression power. The chapter "I have a blister on my foot" starts with Asterios while looking at what plunging into his foot, continues with the tiny details of daily life in the form of a stream of consciousness, and ends with looking at the bubble beneath his foot again (Forgive me people, who hate spoilers). The term, "stream of consciousness" naturally calls James Joyce by its side. Joyce stands and says one of the most beautiful words in the whole world: Epiphany. An instant awareness. The spark that twinks for a moment. Unexpected new perspective. The falling apple. Eureka! … "Spider" is the least relevant word that comes to my mind when I think about the splinter. Italian photographer Federico Clavarino talks about his own splinter, "There is a spider crawling on my back, I cannot reach it in any way, but I feel the legs pattering on my back" and he throws the book of sunburns and shadows on the table, the book of pimples and voids, swingings but not fallings, those who insanely have an urge to look ahead, the enigmatic book of wrinkled ones, Italia o Italia. In a different corner, with a completely different name, the same "bed of nails" feeling. 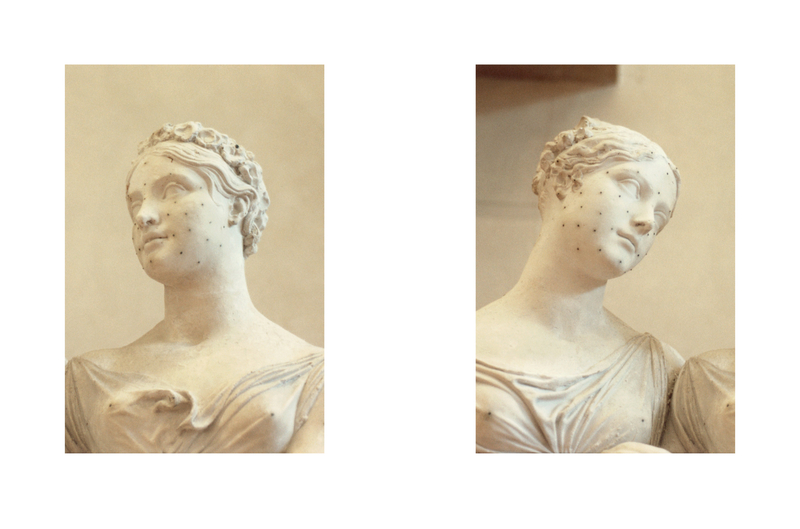 The imbalanced/loose end feeling created the anomaly in Clavarino's photos overlaps with the idea of spider which can neither be reached from the bottom nor from the top. The idea of a little thing that bothers systematically and regularly, of course, calls the idea of a splinter. Here I cannot deny the effect of being familiar with Clavarino's mind combining visual and literary. At this point, we encounter with the most disturbing and aggressive image of the splinter on one hand and the most literary image on the other. All those little thinking exercises focus on the tiny and disturbing things, but on the other hand, the idea of universality comes from those tiny things strangely creates the feeling of not being alone. I am trying to create a balance between meanings and myself, as in the case of the splinter. As a result, again, as Orhan Cem Çetin said, "Meaning does not pass from photo to person, it passes from person to photo". I can replace everything in that sentence with the word photo. As long as I can make my own sense of everything, I stop and smile at everything.